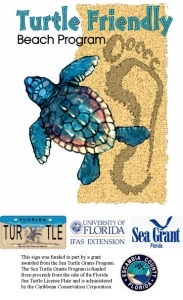 Summary: Florida Sea Grant extension agents along the Florida Panhandle will work with local marine turtle permit holders and beach-front property owners to establish criteria and guidelines to make developed beach habitat as sea turtle friendly for nesting as possible. Activities will include reducing the effects of artificial lights, removal/relocation of beach furniture at night, protecting/re-establishing sand dunes, cleaning up marine debris, and educating beach users. Facilities (hotels, condominiums, restaurants, etc.) and individual homeowners that work to meet these guidelines will be recognized as providing Sea Turtle Friendly beaches.